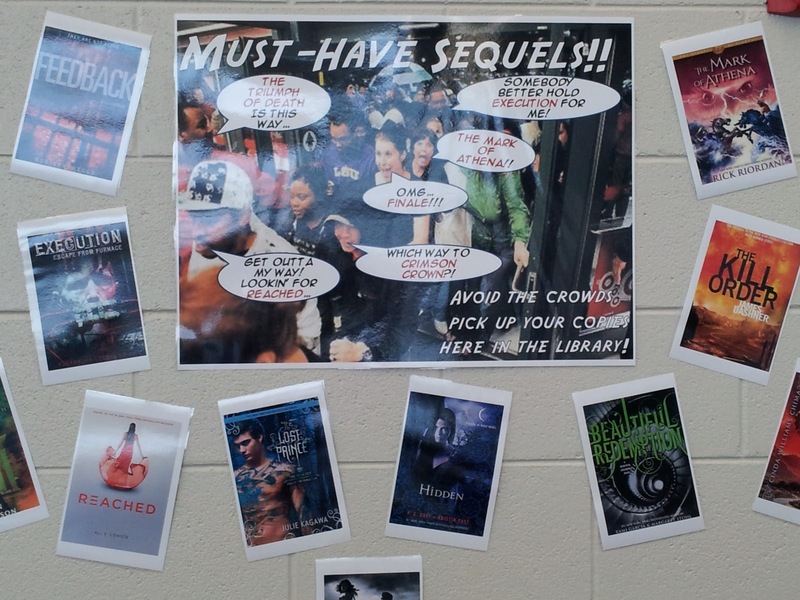 New Library Displays - Wutchuwant? and MUST-HAVE SEQUELS!! I'm a total XM radio junkie, and station 2 - Hits 1 - is one of my main jams. 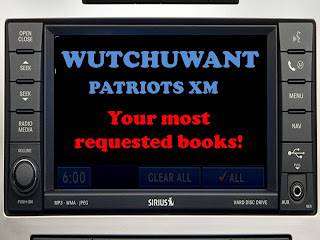 A regular feature of the channel is their daily "Hits 1 Wutchuwant Countdown" where the station countdowns the top five most requested songs of the day by listeners. Pop culture thief that I am, I thought, "Why not make my own Wutchuwant countdown for my library featuring, duh, our top circulated items?" 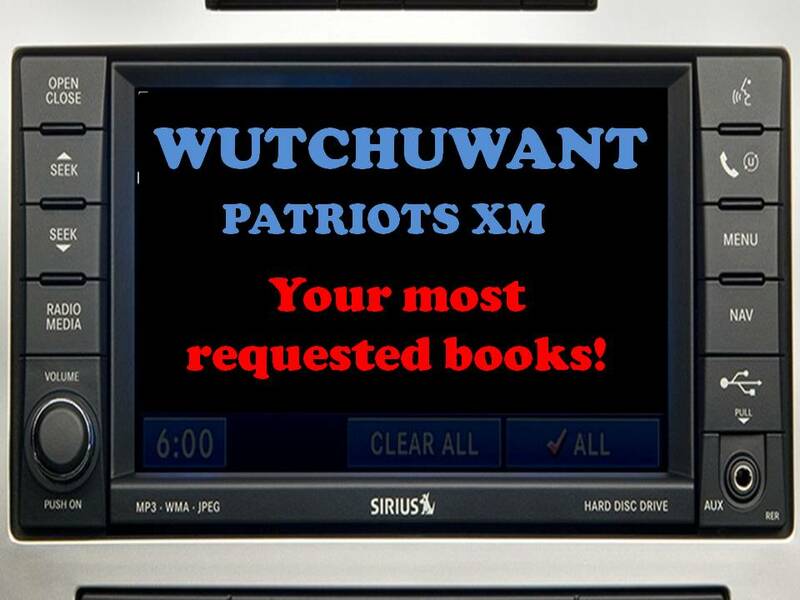 It was easy enough to find an XM radio picture via Google Images, so the poster wasn't difficult to design at all. 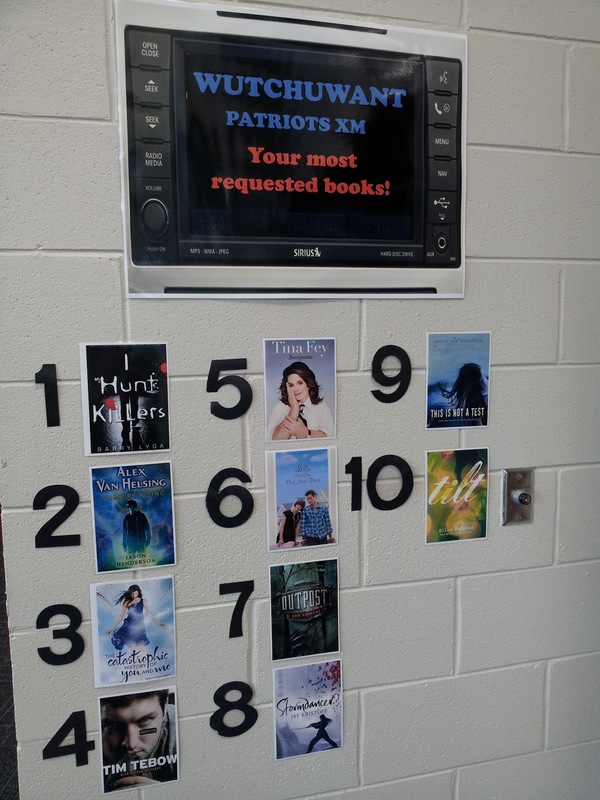 If you're a Follett Destiny person, just go into Library Reports and choose the Top Titles feature to see what those titles are (you can also do most requested holds), and voila!...you've got a display. Best of all, this little display works ALL YEAR. The only thing I change are the book covers every 2-3 weeks. Students really do pay attention too, because I end up getting hold requests based on what they see their peers are also reading. Ahh, the power of popularity. 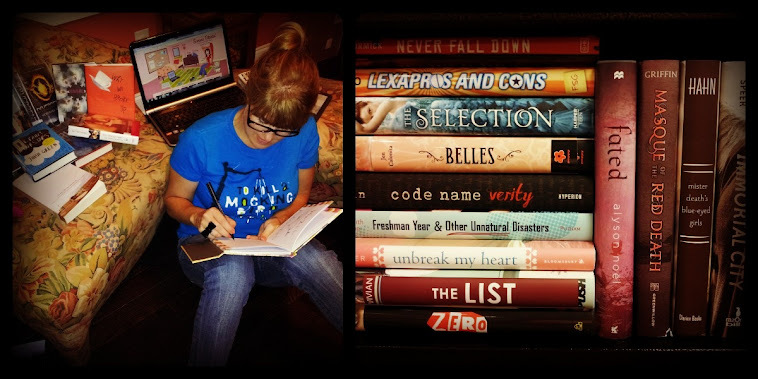 October and November are always big book release months, and this year has been allllllllll about the sequels! 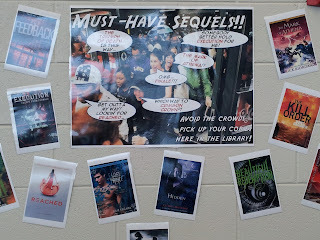 Me and my students have been anxiously awaiting Becca Fitzpatrick's Finale, Rick Riordan's The Mark of Athena, Robison Wells' Feedback, Kami Garcia's Beautiful Redemption, and Cinda Chima's Crimson Crown, just to name a few. 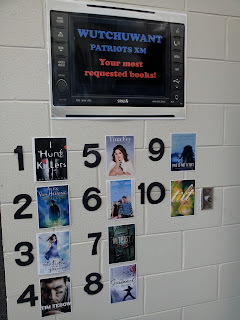 To let my students know what to expect (because Ally Condie's Reached and Alexander Gordon Smith's Execution are still to come! ), I created a 'Must-Have Sequels!!' display. Using an image of shoppers on Black Friday (who better to capture all that anticipation and excitement? ha! ), I then added captions about the different books alongside the peeps with the tagline, "Avoid the crowds - pick up your copies here in the library!" This dispaly is directly behind my circulation desk, so it's easy for students to see and immediately put in their hold requests if all of our copies are out.